KIEV, Ukraine -- Prime Minister Stephen Harper's visit to Ukraine this week has offered some clear signals that Canada is concerned about recent developments in Ukrainian politics, particularly violations of human rights, a pro-Russian orientation, and the growing accumulation of power in the hands of President Viktor Yanukovych. In taking such a clear stance, Harper's position departs from that of countries of the European Union, which appear to be concerned primarily about regional stability and favour warmer relations with Russia. The EU's motivation, ostensibly, is the need for reliable imports of Russian gas and oil, which were disrupted frequently during the administration of Yanukovych's predecessor, Viktor Yushchenko. The Canadian prime minister seemed more at ease during his visit to L'viv on the second day of his tour than during official meetings in Kyiv. At the latter, he was addressed in Russian by Ukrainian Prime Minister Mykola Azarov. During an emotional visit to the memorial to the Famine-Holodomor of 1932-33, Harper referred to the horrors of that event without using the word genocide. Yanukovych, perhaps relieved, acknowledged the enormity of the famine, but referred to it as a crime that also affected Russia, Belarus, and Kazakhstan. In short, the Ukrainian leader repeated the perspective offered regularly by the Russian leadership. In L'viv, however, Harper could be more forthright. In the capital city of Western Ukraine there is little affection for the Yanukovych government. The prime minister made a point of visiting those directly affected by the authorities' clampdown, including historian Ruslan Zabilyi, an employee of the Ukrainian Security Service (SBU) who was detained when alighting a train from L'viv to Kyiv, interrogated for some 14 hours, and accused of passing on classified information to third parties, reportedly documents pertaining to Ukrainian dissidence movements of the 1960s. Zabilyi works at the Lonsky Prison, now SBU property, which was used both by the Soviet NKVD and Nazi Germany during the Second World War. Historians worldwide have signed a protest letter against the detention of Zabilyi and the SBU's intent to launch criminal proceedings against him. Harper also met with Borys Gudziak, Rector of the Ukrainian Catholic University of L'viv, who was also approached by the SBU last May and warned that students taking part in protests against the government would be prosecuted. 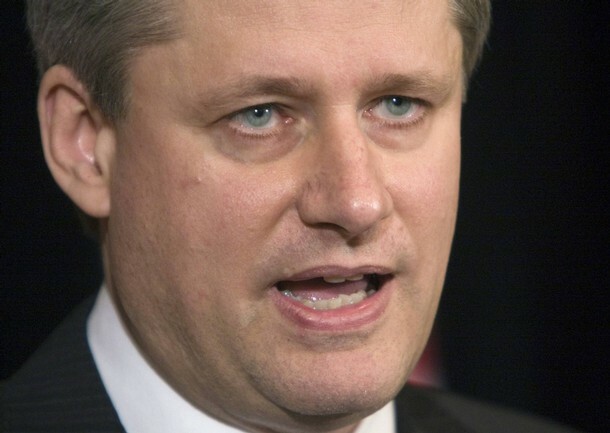 In his talk at the university, Harper did describe the famine of 1932-33 as genocide. The impact of the his visit to Ukraine is hard to determine. It received little publicity in the Ukrainian media other than on the Internet. However, in Canada, there was a positive response from the Ukrainian community, which has expressed its concern with the latest developments in Ukraine. Canadian Ukrainians, in contrast to their American counterparts who protested the visit of Yanukovych to New York last month and refused to meet with him, have continued to be critical of the new Ukrainian government while maintaining a dialogue. Yanukovych's public statements claim that he is committed to democratic reforms and open to advice. His comments are echoed by U.S. analyst Adrian Karatnycky, a Senior Fellow at the Atlantic Council, who notes that Yanukovych is "responsive to criticism" and "is aware of the potential of society, which was the lesson of the Orange Revolution." Dominique Arel, Chair of Ukrainian Studies at the University of Ottawa, states that it is unclear which direction Yanukovych will turn in the future, implying that a pro-Russian direction is by no means certain. However, overall the signs are not too promising. On Oct. 1, Ukraine's constitutional court annulled the political reform of 2004, meaning that the country returned to the status of a presidential republic, in which the president chooses the prime minister and cabinet. In theory there is some logic to the move, in that the 2004 amendments amounted to something of a backroom deal to prevent bloodshed during the Orange Revolution and left Yushchenko lacking in authority. Yet the return to the 1996 constitution means that Yanukovych has formidable powers. Moreover, such a major constitutional reversal should be accompanied by a new presidential election, but there is no question of such an eventuality in Yanukovych's Ukraine. The municipal elections scheduled for this weekend similarly have been carefully engineered to ensure a victory for the ruling Regions Party. Ukrainian analyst Mykola Riabchuk makes reference to what he terms the "KGB-ization" of society, with a powerful SBU and a cabinet dominated by what might impolitely be called "the Donetsk Mafia" bending rules whenever it suits them and curbing the media. Yanukovych claims to be open to reforms and supportive of Euro-Atlantic structures, but has rejected NATO membership and accepted a proposed renovation of the Russian Black Sea Fleet. Moreover, the attitude of some of his team -- most notably Azarov and Education Minister Dmytro Tabachnyk -- is closer to a Soviet than a democratic mentality. The irascible Tabachnyk in particular does not consider the western regions part of Ukraine and denies that the famine was genocide. Thus it is to be hoped that Ukraine heard Canada's message loud and clear. It was one of concern for a formerly close friend that seems to have taken some very wrong steps indeed.